Starburst wall decor pieces look like they have fallen straight from the heavens. Check out our top picks! The sunburst wall art has enjoyed popularity ever since craftsmen paid homage to our planet's source of life, the sun. Sunburst designs for walls offer the easiest way of adding vibrancy and color to living spaces. However, they come in all hues, sizes, and designs. To find out which sunburst wall decor is the best in adding a focal point within your home, keep on reading as we've prepared a buying guide just for you. Sunburst wall decor is the perfect opportunity for you to break out of the confines of a color palette. It is, therefore, essential that you don't get stuck of thinking that you should only display a wall decor that's of neutral tone or color. Before you decide on a product, you must consider how it will feel when it is placed in the room. Hanging a too-small wall decor with a sunburst silhouette in a massive wall will obviously call for something that is larger. Having too dinky or too small decor is a common mistake, but it can be avoided if you know a product's dimensions before you make your final decision. Obviously, you won't need the perfect proportion when adding wall decor into your home, but it should, at the very least, feel right when it is mounted. If you are purchasing on a whim, always remember that it is better if you err on the size of large rather than small. A large sunburst wall decor will create a magnificent focal point and fill the room's visual field. A small decor, on the other hand, will look like it is an afterthought. Sunburst wall decors differ in terms of style. There are glamorous and understated ones, while others exude vibrancy and excitement through colors. The one that is best for your home will depend on your personal style and personality. If you happen to become indecisive after finding that there are several incredible pieces available in the market, we suggest you get the one that you find interesting or one that expresses your story. Now, you're ready to scour the market! Check out our top picks first as we've compiled the latest bestsellers! Featuring retro sputnik lights and starburst accents, this art showcases several sleek arms in varying lengths. Every single arm is added with a clear acrylic bead that's perfect in bringing understated glam to your living spaces. This wall décor also comes ready to hang. This 2-pc starburst wall art can fit any room design or theme. It's even perfect in adding a bit of luxe and texture to bathrooms. With its silver finish, you won't have a hard time in combining this with patterned papers and bright colors. Essentially, you will never go wrong with this wall decor set. This one's a bestseller with its irregular shape that is perfect for modern spaces. This contemporary sculpture comes with brightly tinted elements that can add excitement and variations to your room's color scheme. It's also ready to hang and handmade by skilled artisans. 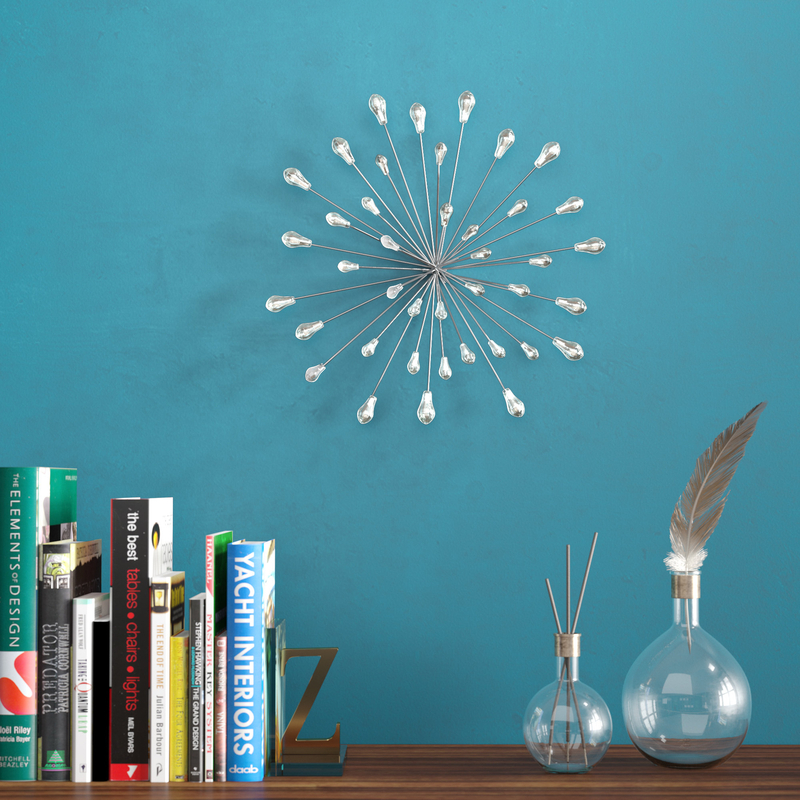 This metallic starburst wall decor can set a room's tone. The gold finish lends an Egyptian feel which anybody will love. It effortlessly stands out, especially in a neutral colored room. Crafted of metal, it comes ready to mount or hang without any hanging hardware required. You'll be happy to know that it is safe for both indoor and outdoor use. If you thought starburst designs look outdated, this take of Willa Arlo Interiors of the sun bursting will prove you wrong. It is not just modern or contemporary-looking, but it also exudes glam and a hint of luxury. With its teardrop beads and sleek, silver-finished rods that extend from the center, your walls will have the flair that it once was lacking. Give your room some sense of texture with this Starburst Wall Decor by Stratton Home Decor. It's handcrafted, hand painted, and durable despite of its fragile silhouette. The vibrant shades of gold, gray, and black give this stunning metallic wall art a versatile appeal. It is the perfect choice if you want to incorporate an earthy touch into your contemporary setting. Another handcrafted and hand painted wall decor, this Starburst Etched Metal Decor by Everly Quinn creates an impression that light is pouring outwards from the textured orb. It comes with two wall hooks for easy mounting and it's a must-have for homes that require decor that's simple but attention-grabbing. Impress your guests with this stylish wall décor! Into modern, understated design? If so, then this one's for you! The muted copper finish and striking sunburst silhouette of this 3-pc wall decor set will add dimension to your living room. It won't just fit your home perfectly, but it will also expand your space visually. It is one of the cheapest and fastest ways of dressing up your walls. Perfect for those who are looking into adding vibrant colors to traditional living spaces, you will be impressed with the workmanship that's been employed with this sunburst wall decor. It is made of 100% iron that is both foiled and lacquered. It is great for brightening up walls, especially in rental apartments. Last but not the least is a favorite among homeowners. It's a mirror with a sunburst design, capable of adding bits of texture and visual weight into your interiors. This masterpiece, which is also our personal favorite, determines a room's tone and feel. Its rough texture will make your space feel grounded and intimate - that's for sure!